Forget what you know about shopping in suburbia. 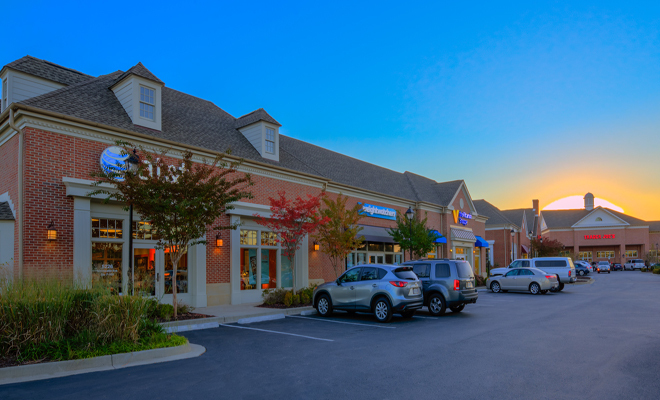 You won’t find the endless sea of strip malls and parking lots in New Town, Williamsburg, VA. What you will find is a return of what has long been missing from our daily lives…what you want, where you want it. At New Town you can drop off the kids to their dance class or daycare, walk to the corner for coffee, go to the bakery, grab some flowers from the florist, go to the dentist, the bank, the doctor, work out at the gym, go to your attorney’s office, see a movie, browse Barnes and Noble, shop for groceries, get some other errands done, without ever getting in the car. What’s even better is that you can do it all in walking distance from your home. The retail is aimed at the needs of those that live here and is located with a keen eye on convenience. Whether it’s a salon, the groceries, or the gym, all are available in a way that makes life easier for you. What could be a better commute than no commute at all? In New Town, Williamsburg, VA, the distance barriers are being broken down for all types of business environments, and the office is no exception. Who said offices should be separate from the places that we live and play. 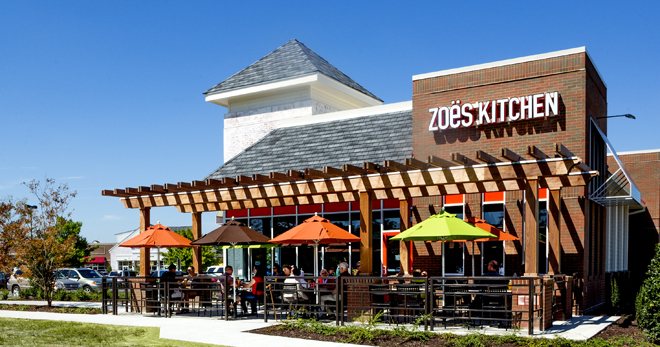 Big and smaller companies alike have space walkable to dozens of restaurants, shops, and services. No more rushing the lunch hour. The only drawback to living and working in New Town? No more calling in late because of a back up on I-64! 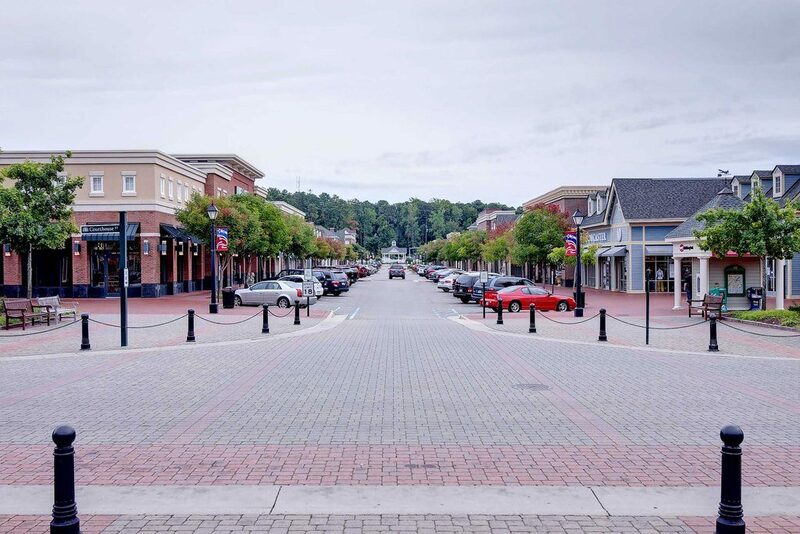 Design details like narrow streets and wide sidewalks ensure that the streets of New Town, Williamsburg, VA are inviting to the pedestrian, making a sensible choice of what was once not an option in the suburbs. 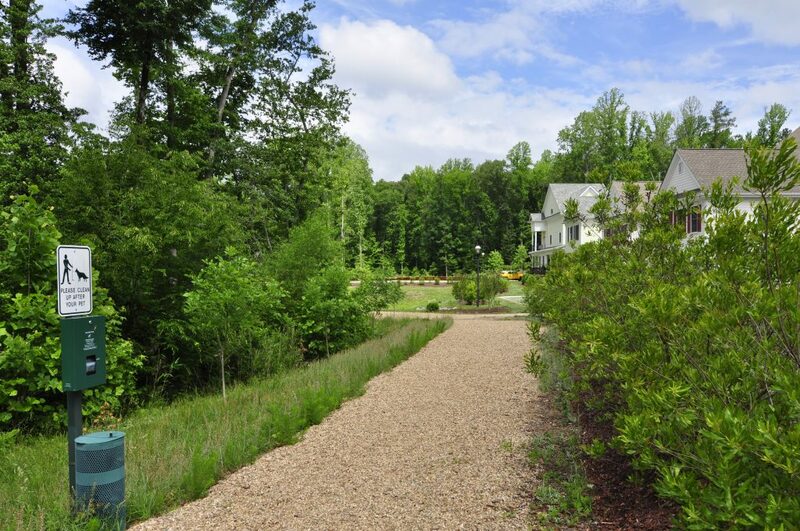 In New Town, Williamsburg, VA everyone has the chance to experience wonderful outdoor settings within easy walking distance from their homes. 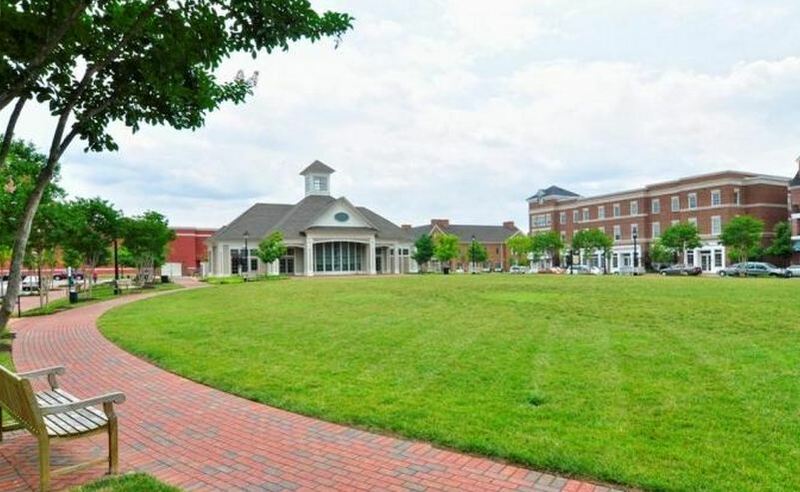 No matter where you are in New Town, Williamsburg, VA there are plazas, greens and courtyards. You will surely find your personal favorite among the dozens of neighborhood parks. In New Town the streets are interconnected with each other and provides over four miles of continuous trails through over three hundred acres of a park system. Roads. There have always been too few to handle the traffic of the suburbs. The fact is, there will never be enough roads if cars are the only way to get around. Community buses provide chances for residents to conveniently travel to Colonial Williamsburg and other parts of James City County without having to drive and park. There is an Amtrak Station within a few miles in Williamsburg which provides a link to Downtown Richmond, Washington DC, Philadelphia, New York City and beyond. Most importantly, New Town is proving that businesses and homes can exist in close proximity enabling people to live in a truly walkable distance from nearly all of their daily needs. At New Town, Williamsburg, VA the choice of how you travel is back in your hands. New Town, Williamsburg, VA is a place for all people. It is that simple. Gone is the notion that you have to have kids, or have to be an “active adult” or other category of lifestyle. A wide variety of styles of housing, providing equal opportunities for living by those of vastly different means. GREAT NEWS for New Town residents. 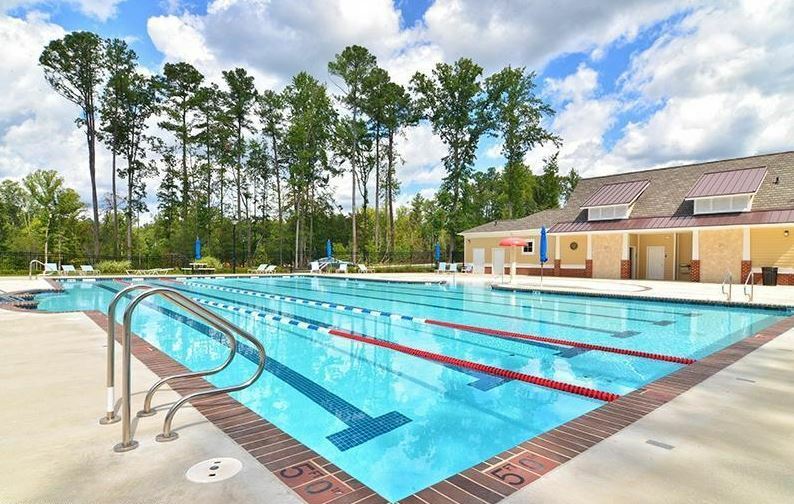 The neighborhood pool in New Town pool is now open for regular use. The pool is a 25 meter six lane pool with a zero entry splash area for kids. If you don’t already know, the pool is located in the Charlotte Park neighborhood at the intersection of Elizabeth Davis and Center Street. Once complete the residential areas of New Town will comprise approximately 1,000 porch and traditional homes, garden apartments, town & carriage homes, condominiums, and live-work loft condos all designed within a street grid pattern to foster community interaction. 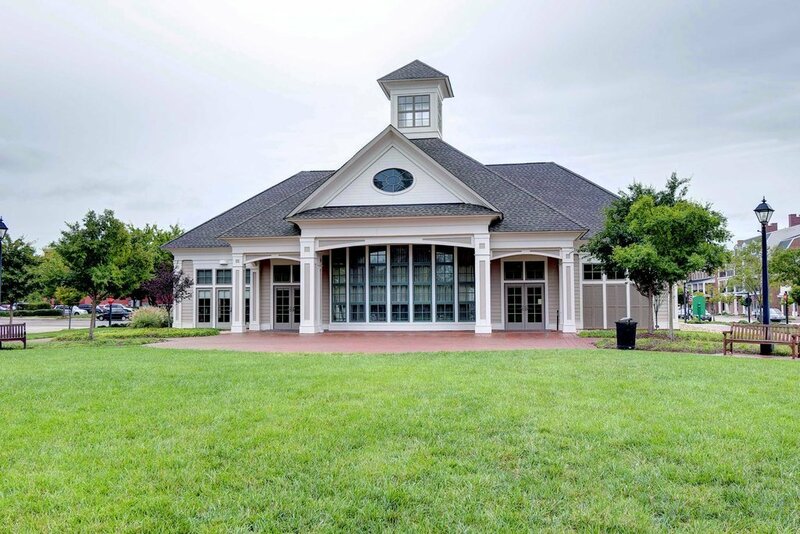 Housing choices in New Town include Charlotte Park ,New Town’s newest neighborhood of single family detached homes on tree-lined streets, all with front porches, and many options and floor plans to select from. Each home will overlook a green space or park, while alleys allow access to the rear of the homes and to the two-car detached garages. The neighborhood swimming pool is only a short walking path away. Home interiors offer such upscale amenities as hardwood floors and granite countertops. Cascades of natural light from many windows, and high ceilings are a few of the many architect-inspired innovations that contribute to the ambiance. Condominium Choices in New Town include Bennington on the Park and Foundation Square as well as a small number of Condos Over the Green Leafe Café and Center Street Restaurant. Foundation Square’s condominiums,start in the $230’s with Exclusive underground parking included. Peace of mind with condo’s low maintenance and controlled access. Single level living means no stairs and there is a dedicated generator provides power to elevators in case of a power outage. Standard features at Foundation Square include granite counters, stainless appliances, tiled baths, custom solid adjustable shelving in the closets, private balconies- some with park views, elegant crown molding and so much more! The Bennington on the Park condominiums offer one-level living in the Heart of New Town. Amenities include a fully secured building with reserved and covered parking, elevator service to all floors, and private fitness facilities. The building has 40 upscale residences ranging in size from 950 sq. ft.(1 bedroom) to 1600 sq. ft.(3 bedroom); many of the condos have dens. The main level features a fitness workout facility & private storage. Every condominium has at least one patio/balcony, and more than half have stunning views of Sullivan Square Park.The upscale finished include granite countertops in the kitchen, hardwood in the foyers, 12 inch tile in the bathrooms, and solid-core doors. Chelsea Green townhomes offer a combination of smart, thoughtfully planned residences. Choose from five innovative plans. The tri-level designs offer open, transitional living spaces with a long list of distinctive features. *Second-level kitchen and living area *First floor bonus space in select plans, ideal for your home office *Plentiful natural light throughout *Decks overlooking streetscape *Alley-loaded, two car garages. Savannah Square:These brownstone-inspired townhomes with wide open spaces for living and dining areas,offer 2 to 3 bedrooms, and optional third-floor ‘retreats.’ Add to these deluxe features oversized garages attached and tucked under. This is luxury townhome living! Eagle Construction of Richmond VA has almost completed Village Walk in the Settlers Market portion of New Town bear Trader Joes. 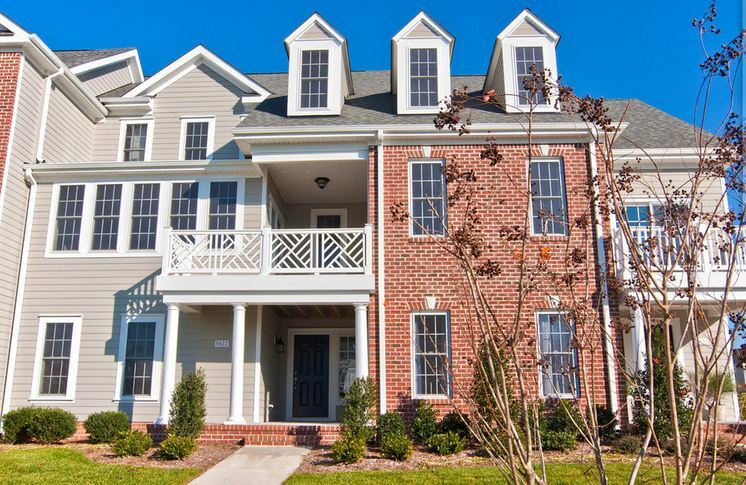 The townhomes are similar to what they built in Shire Place and West Broad Village in the Short Pump area of Richmond VA. There will be 107 town homes in this section. Models are offered in both two story with first floor master bedrooms and three-story models. A few of the homes were built with elevators and some offered roof top decks on the 4th floor. Town homes at Village Walk are Virtually No Maintenance. Homeowners enjoy the unique neighborhood concept with charming facades and front porches facing each other across landscaped greenspaces. Brick, stone, shingle and clapboard siding make sure that each home is uniquely stylish. Inside you’ll find large sunny windows and tasteful details waiting for you to personalize to your heart’s content. Whether you prefer warm granite, sleek stainless steel, or glass mosaic tiles, your home becomes a fitting reflection of you, ready to furnish with personal favorites and stylish new buys. Best of all — no outside maintenance so you can enjoy the lush landscaping and architectural detail with no worries or responsibilities. There are also town home style apartments for rent available at The Pointe at New Town. Cogan’s Deli & Sports Pub – Homemade, high quality sandwiches, soups, salads and more! El Tapatio Mexican Grill & Bar – Best Mexican Food in Town! Jimmy Johns Gourmet Sandwiches – Americas favorite sandwich delivery guys. Freaky Fast. 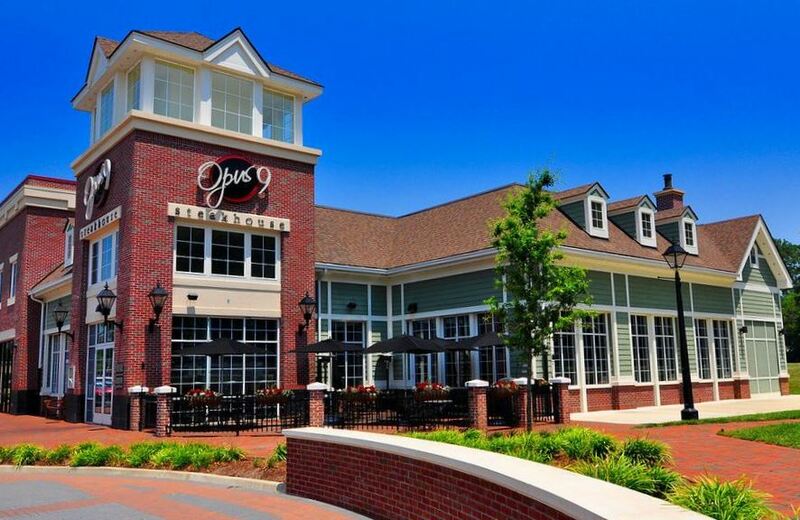 Opus 9 Steakhouse – Casual Elegance, Personalize Service, Relaxed Sophistication. Trader Joes, Fresh Market, Wal Mart Neighborhood Market are within walking distance. 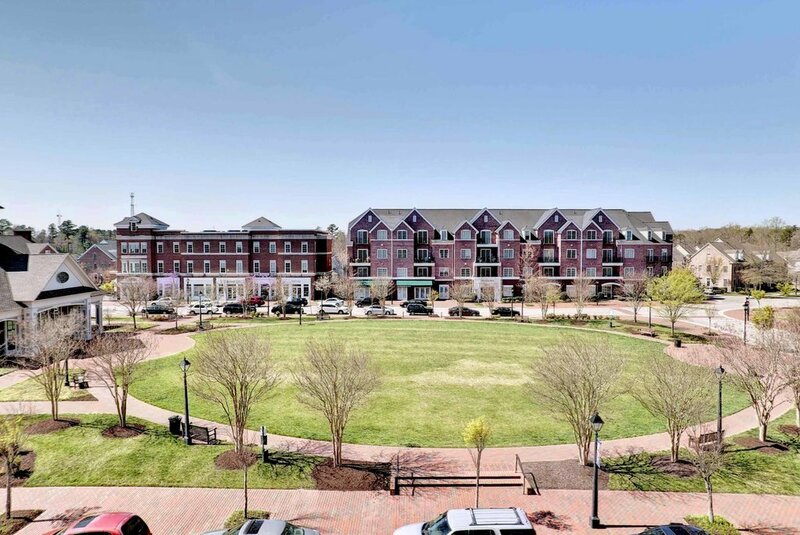 From Catherine’s lovely town home in Abbey Commons, she can survey New Town from her windows. Although she had lived in Williamsburg for 20 years, she had finally found the perfect place for her busy life and has lived in New Town for three years. Does she have time to rake leaves and edge borders? No. Does she want to be bothered with exterior maintenance? No. She’s very satisfied that Abbey Commons always looks top notch, and she doesn’t have to lift a finger. Her spare time is spent traveling and kayaking on the James River, or heading to Blacksburg for a tailgate party and football game with her daughter, Jenny, a junior at Virginia Tech. Daughter Sarah is a newlywed and currently lives in Texas. define New Town’s slogan: Live. Work. Play. The Pharrs, originally from North Carolina, have known each other since the age of 12. They have been married for 38 years and have lived in Williamsburg for 30 years. Dr. Pharr is a well known ENT physician, having practiced since 1977. Cheryl, a graduate of William and Mary with a B.S. and M.Ed., pursued a career as a chemistry teacher but changed her career to grief counseling. For the past ten years she has helped people cope with the loss of a loved one. When asked what is their favorite place in New Town, both are quick to respond “the movie theater,” which is just a quick walk from their front steps. But they both agree that the residents of New Town are an added attraction because they are all so friendly. When not at the movies, the Pharr’s passion is antiques, and they consider this area a wonderland of treasures. They enjoy seeking out antiques and refinishing them. Cheryl, an avid reader, is happy to welcome the new Barnes & Noble to New Town. A retirement home in Nags Head or a townhouse in New Town? For Dr. Scott Pharr and his wife, Cheryl, the decision was eventually easy. New Town won out because it had a movie theater. Well, that wasn’t the only reason. Actually the Pharrs fell in love with the Charleston townhome model and were especially impressed by New Town’s walking-distance proximity to restaurants, shops, bookstore, and entertainments that they would ordinarily have to drive all over town to enjoy. New Town resident Joe Majcher is a lifelong runner. His love of running has never diminished, even when he was diagnosed with Parkinson’s disease a little over a decade ago. At its core, Parkinson’s is a movement disease, so Joe jokes that “I’d better keep on moving.” And move he does. The man never stops! Joe and his wife Bunny are both active.In fact, one of the reasons that they have enjoyed their move from Kiln Creek to New Town so much is that they can walk everywhere. The couple currently resides in Oxford New Town with their dog Jessie and their cat Tu’do in a two-bedroom with den model, and love being in the middle of things. Bunny loves being within walking distance to everything and says that the most refreshing aspect of living in New Town is that “everyone is so friendly.” While she enjoys the shopping that New Town has to offer, she also enjoys being near so many restaurants and eateries because it gives her an opportunity to try different cuisines that she just wouldn’t cook for herself at home. Joe passionately advocates running, walking and a daily workout, such as one might get at the Iron-Bound Gym, as significant factors in keeping Parkinson’s in check. He has even been a guest speaker for a group of University of Virginia (UVA) doctors to help enlighten them of his experiences as it pertains to the disease. He also frequently spends time with other Parkinson’s patients to teach them the benefits of exercise. Both Bunny and Joe are members of the Colonial Road Runners and have run in many races. Joe has run in more than ten marathons and numerous half-marathons, and has even done the occasional Goofy Half Marathon and Marathon race at Walt Disney World, which is a total of 39 miles in one weekend. Both are fans of Olympian Jeff Galloway and his book, “Run Injury Free.” Galloway advocates a run/walk method, which can increase endurance and help prevent running injuries. Joe and Bunny use a one minute walk break for every nine minutes of running, and are able to keeps their race times competitive, as each walk break only takes a few seconds away from their overall finish time. They are an inspiring, on-the-go couple, in love with life and good health. They also love New Town. When Jack Schwolow moved into his New Town Center Street loft in October of 2006, he knew he had made the right move. He wanted to be within walking distance of what’s happening, and we all know that New Town is a happening place. Jack’s life, however, seems to be a study in the right moves. He is a graduate of Christopher Newport University where he majored in Leisure Studies and Recreation. It was at CNU that he began his tennis career on the men’s tennis team. He also served as assistant volleyball coach for the CNU women’s team. While attending CNU he also interned at the Kingsmill Tennis Club which propelled another move in his life. His Kingsmill experience led to a full-time tennis professional position, which he held for nine years until a wonderful new career moved his way. Jack is now Manager of Membership Services at Kingsmill and is in charge of all aspects of membership from welcoming new members, helping existing members, publishing newsletters, planning special member events, and more. Although he keeps up with tennis, he has also developed quite a swing on the golf course (handicap 7), but every year he takes the time for his annual hunting trip to South Carolina. He confesses that the peace and quiet of the outdoors is more a driving force than hunting itself. As for life in New Town, Jack likes being able to walk to everything. And with new restaurants, entertainments, shops and stores opening every day, New Town definitely keeps him moving. One seldom thinks of a soccer field as a romantic setting to meet your life companion, but that’s exactly what happened to Chris and Lydia Scrofani. Married in July, they are new residents of New Town, occupying a town house and still enjoying evening ice cream just steps away. Chris played soccer for William and Mary and went on to play professional soccer for five years. Lydia, originally from Washington state, played soccer for the University of South Carolina and went on to play in a semi-pro league in 2001, called the Boston Renegades. She also found time to earn her MBA at Farleigh Dickinson College where she was also assistant soccer coach. Soccer is a big part of their life.Chris is Vice President and Programs Director for the Williamsburg Indoor Sports Complex where he works with both youths and adults. He is very involved with First Touch Soccer Academy for youngsters age 2 to 6, and are also heavily involved with the Virginia Legacy Soccer Club. Lydia is in her third year as assistant soccer coach at William and Mary. This athletically inclined couple gets a real kick out of New Town. They bought their townhouse because they considered it a good investment and a fun lifestyle. They like walking and jogging around New Town, and they like the nearby convenience of such entertainments as the movie theater and restaurants. In the summer they are regulars at the After Hours concerts. In whatever spare time they can muster up, Chris likes a good game of golf and Lydia enjoys arts and crafts and chick flicks. And surprise! They both like to work out, another New Town bonus. Before settling down to start a family, the couple plans to adopt two small dogs, and they also plan to travel. In the works is a possible ski trip to Italy where Chris has relatives. In the meantime, the New Town lifestyle is still a honeymoon.